The Scottish FA in partnership with the Scottish Professional Football League have created an awareness campaign designed to tackle the growing concern of pyrotechnics inside football stadia. 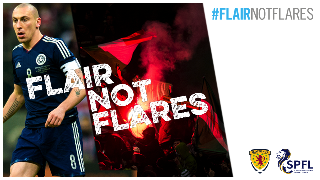 #FlairNotFlares has been launched to assist clubs in promoting the positive aspects of the matchday experience, and to counter the threat to the health and safety of supporters caused by use of flares and other pyrotechnics in football grounds across the country. The football bodies and senior clubs are encouraged to use the bespoke campaign around matchdays in a collective effort to eradicate the use of flares inside the stadium. The move has been supported by Police Scotland and the Football Safety Officers Association (Scotland). Peter McLaughlin, Scottish FA Security and Integrity Officer: “Unfortunately, Scottish football has not been immune to the growing trend across Europe of pyrotechnics being used by fans inside football stadia. “Indeed, we have already seen examples in Scottish football of club facilities being damaged by the use of flares, not to mention the safety of supporters, match officials and players being compromised by these devices – some of which are now home-made and smuggled-in in various parts – being thrown indiscriminately across stands and on the field of play. “We have been privy to even more horrifying examples across Europe, where people have been seriously hurt and lives put in jeopardy, and it is our intention to work together to ensure fans can continue to watch Scottish football in comfort and safety.